Comfortable apartment set walking distance from major city sites such as Spanish Steps, Piazza Navona, the Pantheon, near transports that will allow you to reach the other parts of the city, near shops and restaurants. Independent heating, AC, TV, washing machine, microwave, hair dryer, fans, internet WiFi, elevator. The apartment, enterily restructured, is at the first floor of a historical palace of the nineteen century with an elevator and a doorman. 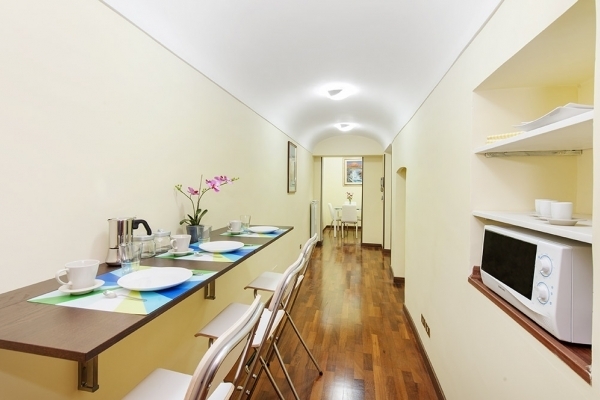 It is near Via del Corso, Via dei Condotti and the main shopping streets and attractions of the capital. Great location in Rome. Clean and tidy apartment. Beautiful little appartement in Rome center. We were with 4 children and everything was OK, except the internet. May be can we suggest a little written explication for the waste, because the "concierge" doesn't speak french.